Shipped Direct to You! Ready-to-Wear! Pure 13 BT Primax Sale! Prices Start at Just $1,249! Signia Pure 13 BT Primax is a “made-for-iPhone” hearing aid that gives you high-fidelity speech discernment with true aid-to-aid communication for better awareness of your surroundings. You can now enjoy “better-than-normal” hearing (according to clinical studies) and direct streaming of calls and media from your iPhone. Pure 13 BT Primax has advanced features like automatic adaptive directionality, SpeechFocus, Tinnitus Management and discrete control from your iOS or Android based smartphone with the myControl app. Designed for people with a wide range of hearing loss, from mild to severe, the Signia Pure 13 BT Primax is an RIC style, digital hearing aid that uses the size 13 battery. 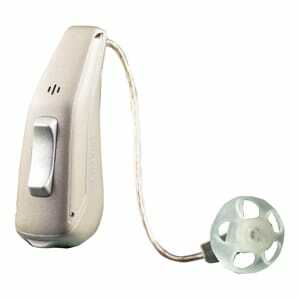 Signia Pure 13 BT Primax hearing aids include a 3 year warranty PLUS loss and damage insurance. Also, each hearing aid purchase from Precise Hearing comes with a 45 day, 100% money back return policy – so your satisfaction is guaranteed. High-Definition Binaural – uses internal communication between microphones in a pair of hearing aids provides exceptional focus on the voices you wish to hear. Direct Streaming from iPhone – Stream calls and media directly from iPhone without the need to use an intermediate device like EasyTek. myControl App – discretely control your hearing aids from iOS and Android devices such as mobile phones and tablets. TeleCare 2.0 Compatible – TeleCare allows hearing specialists to remotely adjust the programming of your hearing aids without the need for repeated office visits.